Saba Vinegar / Mosto Cotto...the grape's honey. Saba, a unique vinegar. Saba is the sweet reduction of grape must. Saba vinegar reduction is cooked down even more than traditional vinegar...to about one-third its original volume. Saba vinegar is cooked directly over an open fire in an uncovered stainless steel kettle. Saba vinegar is sweet, fruity & syrupy, characteristic of 100% Lambrusco grapes. 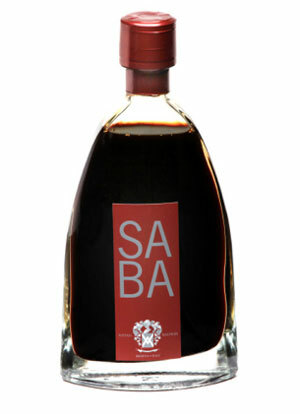 Saba vinegar is more sweet than tart & can be used with fruit salads, fresh soft cheeses, yogurt, or used in marinades. Drizzle Saba over ice cream or cheesecake...use Saba in place of sweeteners in cooking & baking. Saba can be drizzled in sparkling water as a natural thirst quencher, Enjoy!!! Malpighi Saba Vinegar / Mosto Cotto. Cooking method: Malpighi Saba is slow cooked directly over an open fire in an uncovered stainless steel kettle & bottled immediately to prevent fermentation. Saba is also called Mosto Cotto, "cooked grape must"
Saba is not aged, so please use within a year of production.